As I woke up at 2:30 AM to prepare for my 3:00 AM shuttle, I noted to myself that I really need to do the math when planning an early morning flight. When even the birds aren't awake when you rise, you know you have a problem. 6:00 AM flight=too early. Though I managed to take a little snooze on the plane, I was certain I'd be exhausted all day. 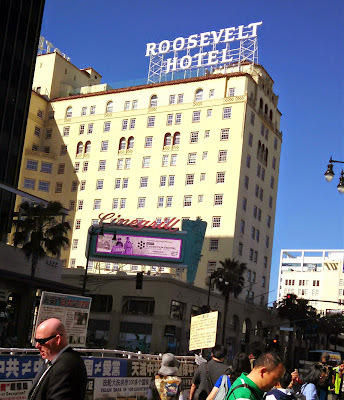 As it turned out, that early flight really wasn't advisable, but my excitement at being in Hollywood for TCM Classic Movie Festival for the second time did plenty to keep me going. It was already warm and sunny when my classic soul loving shuttle driver (best van soundtrack ever) dropped me off at the Hollywood Celebrity Hotel. 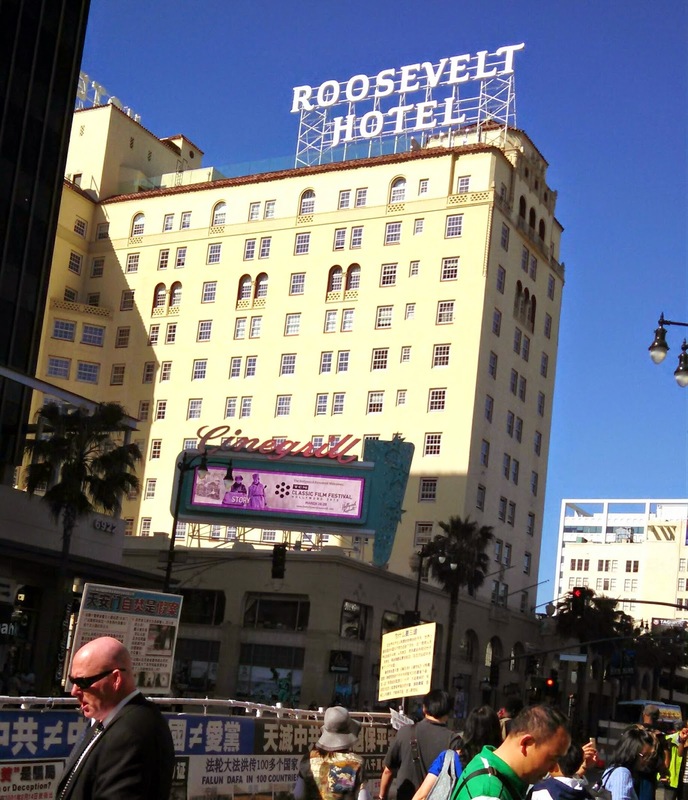 I stowed my bag, grabbed a smoothie and walked over to the Roosevelt Hotel to pick up my media pass. 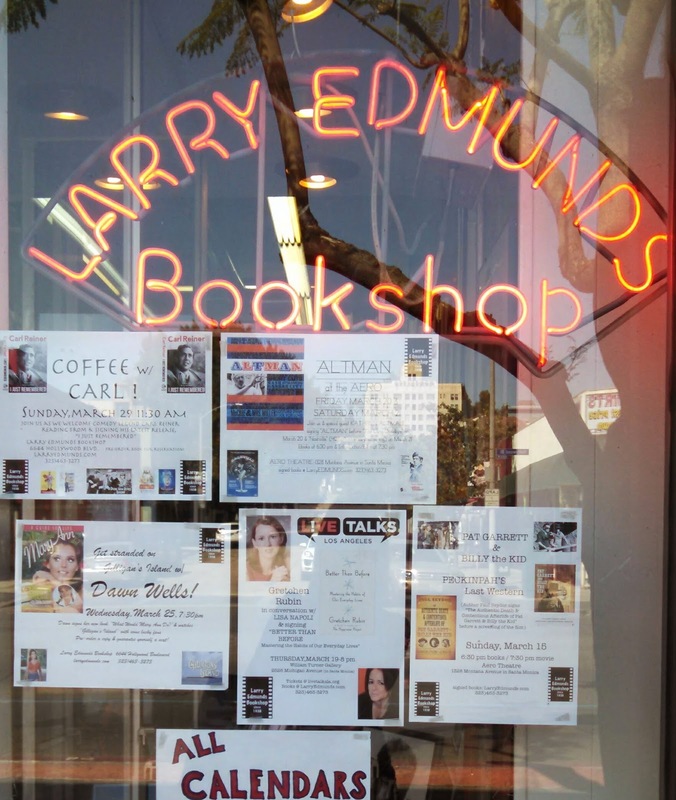 Then I scooted down Hollywood Boulevard to check out the Larry Edmunds Bookshop. I was joined by one of the many Spidermen who regularly crawl down the Hollywood Walk of Stars looking for tips from photo happy tourists. This particular Spidey just wanted to tell me all about the LA Film Festival. Oh Hollywood. Though Larry Edmunds was packed to the gills with amazing books as usual, I found, as last year, that I already owned or had read much of what they had. Still, if you are a collector, check out this store for posters, photos, and yes, a great selection of books that will surely hold more treasures for those of you who don't have a 300+ volume movie book library. Then I went on to lunch with my blogger buddy and festival roomie Laura and her husband Doug. I remembered meeting these two for the first time a year ago and it didn't seem like more than a few weeks had passed. I would have that feeling several times over the course of the festival as I reconnected with people I'd met the year before. I'm sure that our constant contact on social media has something to do with it, but I also think the festival experience is so vivid that it sticks with you, in full detail, throughout the year. After lunch, we headed over to the press conference, which was noticeably different without Robert Osborne present. Despite the elephant in the room, no mention was made of the ailing host by either TCM staff or media. 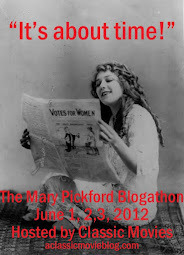 The focus seemed to be consciously on moving forward with the festival. After the press conference, we picked up Raquel and her husband Carlos , and headed out to the Warner Bros. lot for a tour. The wild and witty Matt Patterson of Warner Archive was kind enough to offer a behind-the-scenes look at the lot to interested TCMFF attendees this year. Actually getting access to the lot was quite the experience; I don't recall having to deal with that much security even when I visited the White House in middle school. We were joined by Jill, Jessica and Jessica's parents. I'm sure the typical Warner Bros. VIP tour doesn't involve climbing up inside buildings on fake streets and being shooed away from the Pretty Little Liars set by a security man who seemed baffled that we didn't heed the large DO NOT ENTER sign. With Matt as your tour guide, you get crazy stories, and see things from an enjoyably unusual point of view! If you have the chance to check out the lot, whether by official or more eccentric means, do it. It's fascinating to see the tricks of perspective that make everything look bigger, smaller, closer, further away or whatever a filmmaker desires. The whole world can be constructed on one backlot. 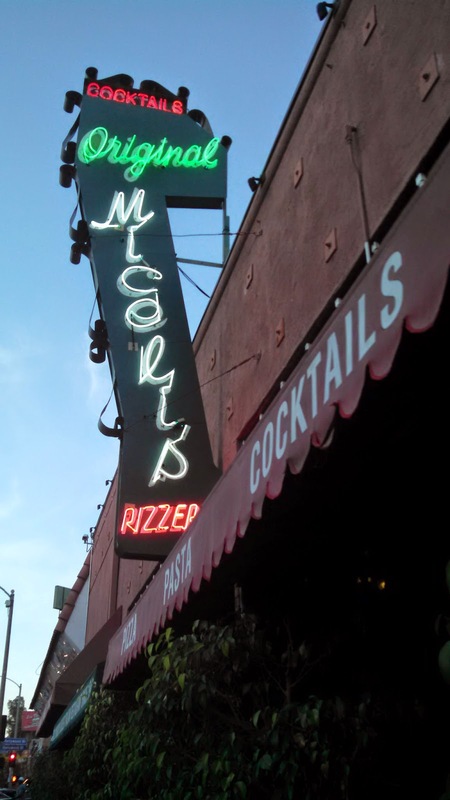 After the tour, I was ready to take a snooze in the hotel, but since I figured I wouldn't get many chances to have a decent meal during the festival, I instead joined a group at Miceli's. I loved the cozy vibe in this classic Italian restaurant, which has seen regulars including Frank Sinatra, Dean Martin and Elizabeth Taylor. I love music and really enjoyed being seated so close to the pianist, who was quite charming. He was sometimes joined by one of the singing servers, all of whom probably have plenty of headshots with their stuff in the backroom. My other festival roomie Casey joined us for dinner after a huge flight delay. I had a tasty Bellini and Chicken Marsala, but it was the atmosphere, and being reunited with blogging friends that made the meal special. Then we went off to Formosa, another legendary Hollywood haunt and Sinatra hangout. There we were packed like classic movie nerd sardines in the box car room at the back of the restaurant for what has become a yearly meet-up. It was fun to see all those people together again, if a bit crazy. One very drunken reveler kept insisting that I was TCM social media maven Noralil Ryan Fores, which I get: white lady, brown hair, black-rimmed glasses, she's my people so to speak, but I definitely felt safer once I'd sidled away from my adamant friend and into a healthy clump of bloggers and Twitter fiends. Soon my early flight began to catch up with me and I was happy my ride mates were all ready for bed. It was a great day, full of catching up, meeting new people and getting increasingly more excited for the festival to begin! I got a kick out of the line about Larry Edmunds: "I already owned or had read much of what they had" The first time I ever stepped foot in there I thought I died and went to movie-book paradise. Out of curiosity (though I feel the answer is yes) do you have the LIFE Goes To The Movies coffee table book from the 1970s? That was the book that sparked my love for classic movies! I don't have that LIFE book. Now you've got me curious! 500 Great Films was the book that gave me my film education. I'm still so grateful my parents got me that for Christmas many years ago.